For Love of the Paint: Q & A - "How do you get such a smooth finish with the Annie Sloan chalk paint?" Q & A - "How do you get such a smooth finish with the Annie Sloan chalk paint?" Today I received a message on my Etsy store with a great question that I'm sure that many of you have! How do you get such a smooth finish with the Annie Sloan chalk paint?" "Sorry if this sounds a bit cheeky but how do you get such a smooth finish with the Annie Sloan chalk paint? I have just painted a wardrobe in Aubusson blue and it's turned out terribly. The paint went really clumpy and has dried very uneven! Did you water the paint down? Or sand down to get the finish? I would really appreciate your advice as you obviously know how to handle a paint brush!!!" To start off a painting project, I would advise you to first turn the can of paint upside down for several minutes before opening to help start the distribution of the heavy sediment particles. Then, shake it WELL - as in, for at least a few minutes if at all possible, as opposed to stirring. This will help to further distribute those particles that would otherwise clump. NOTE: make sure your paintbrush is cleaned well with a mild soap and water before storing it for the night (with the bristles pointed down), otherwise it can develop clumps. Likewise, make sure to wipe down the rim of the paint can - the inset groove can harbor paint, which will dry, crack, and fall into your paint can over time.. plus it could make it impossible to seal the tin entirely and your paint to dry out over time.) Close the lid as frequently as you can while painting so the paint doesn't dry on the inside of the lid, for the same reasons. When you're painting, use an at least moderately high quality brush (you can use one specifically for chalk paint, but I often use something with a smooth bristle like Purdy). I have found that you will get a much better result with 2-3 light layers than you do with 1-2 thick coats. If you are noticing some texture even with the thinner layers of paint, you can sand in between layers, but I don't usually find that to be necessary. 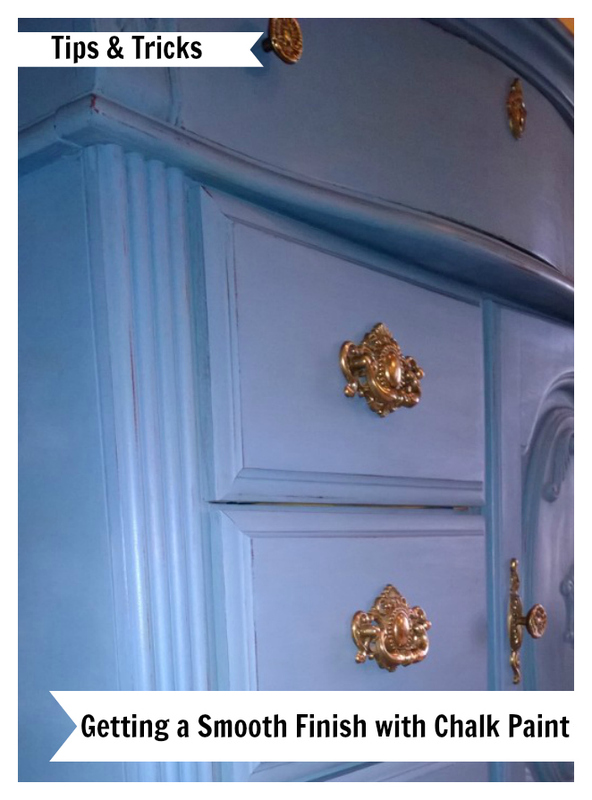 My can of Aubusson Blue was actually less viscous than some of the other Annie Sloan paint colors I have used, but they do get thicker over time with evaporation and are definitely thicker than your standard hardware store paints. If it's gotten thicker due to evaporation, you can always dilute it with a small amount of water and shake well. Sometimes I will also wet my paintbrush a bit and then dip in the paint and paint over the surface in a light wash of the same color in order to facilitate a super smooth finish. Use caution with this though; if you make it too watery it will run/drip, or if you paint too quickly it will aerate and leave little bubbles. Always come back to take a second look in about 5-10 minutes to see if it's starting to drip-it'll be easier to fix it now than it would be later! I DO sand afterward with ideally a 300 grit or higher sandpaper (or at least a 220) for a smooth, polished finish. If you had tiny chalk lumps in your paint, when you sand it, you will notice a white dot left behind. Just use your brush to dab a bit of color on the area and blend it out to the sides, it should integrate and look natural! Thanks again for your inquiry - I hope that this answer was helpful and appreciate your checking out my shop and site! Do you have any pressing painting questions? Or do you want to venture into the great wide world of staining? I also post tips and tricks on my Facebook at www.facebook.com/forloveofthepaint, so you are welcome to Like it and ask me any questions you might have on there as well!